The grapes are harvested when ripe, destemmed, crushed and then fermented for 6 to 12 hours at a controlled temperature (about 30°C) and pressed gently. 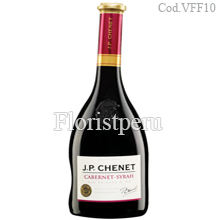 The wine is matured in stainless steel tanks to conserve the rich aromas. * A dark deep ruby red. An intense bouquet of cherry & blackcurrant enhanced with a light delicate spicy note. With a potent aroma, this wine is beautifully balanced and nicely structured.